Top Ten Tuesday is hosted by The Broke and the Bookish. Every Tuesday they post a new Top Ten list prompt. This week’s prompt is… Ten Websites I Love That Aren’t About Books. Looking through my browsing history, I see a distinct theme. I’ve been doing Zentangle and Zentangle inspired art a lot lately, and most of the sites I visit are related to these things. But what is Zentangle®? According to its creators, the Zentangle Method is an easy-to-learn, relaxing, and fun way to create beautiful images by drawing structured patterns. Don’t forget to leave me a link to your own post in the comments. Or leave me a link to a website you really love, and let me know why, and I’ll check it out! A dark presence had invaded the Jorgensens’ house. On a spectacular bluff overlooking the Pacific Ocean, something evil is watching and waiting . . . Tired of the cold winters in Washington, D.C. and disturbed by her increasingly obsessive boyfriend, Kailani Kanaka savors her move back to her native Big Island of Hawaii. She also finds a new job as personal chef for the Jorgensen family. The gentle caress of the Hawaiian trade winds, the soft sigh of the swaying palm trees, and the stunning blue waters of the Pacific lull her into a sense of calm at the House of Hanging Jade–an idyll that quickly fades as it becomes apparent that dark secrets lurk within her new home. Furtive whispers in the night, a terrifying shark attack, and the discovery of a dead body leave Kailani shaken and afraid. But it’s the unexpected appearance of her ex-boyfriend, tracking her every move and demanding she return to him, that has her fearing for her life . . .
House of the Hanging Jade is a suspenseful tale of murder and obsession, all taking place against a beautiful Hawaiian backdrop. Lush descriptions of both the scenery and the food prepared by the protagonist leave you wanting more. Fans of both gothic romance and mystery novels should enjoy this story. Enter the Rafflecopter Giveaway (ENDED) to win an ebook copy for yourself. Amy M. Reade grew up in northern New York. After graduating from college and law school, she practiced law in New York City before moving to southern New Jersey, where she lives now with her husband, three children, dog, two cats, and a fish. She writes full time and is the author of Secrets of Hallstead House, a novel of romantic suspense set in the Thousand Islands region of New York, and The Ghosts of Peppernell Manor, a novel in the same genre set outside Charleston, South Carolina. 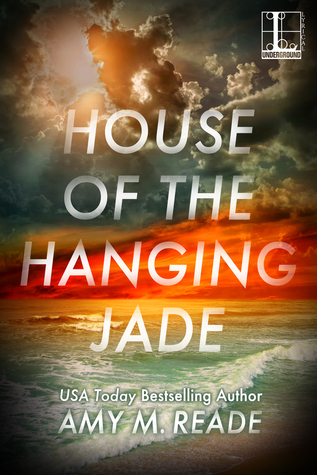 Her third novel, House of Hanging Jade, is set in Hawaii and will be released in April, 2016. She is currently working on the first book of a series set in the United Kingdom (expected release date in early 2017). She loves cooking, reading, and traveling. NOTE: I was provided with a free copy in exchange for an honest review. All thoughts and opinions are my own. 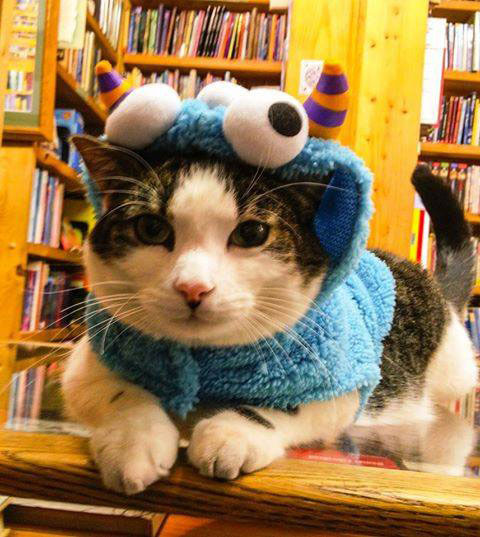 Because I need a little pick-me-up today…how do you beat a bookstore cat in a monster costume?